I love tea eggs. They’re a great way to make hard-boiled eggs flavorful and interesting. They’re also very easy to make, though they do take some time. I like to make them when I can be home all day to let them simmer for hours, filling the house with the smell of Chinese 5 Spice. There are tons of slightly different recipes on the web (the most common variants use soy sauce and star anise), but I like this one. The first step, if you have farm-fresh eggs, is to set them aside in the back of the fridge for 2-3 weeks. 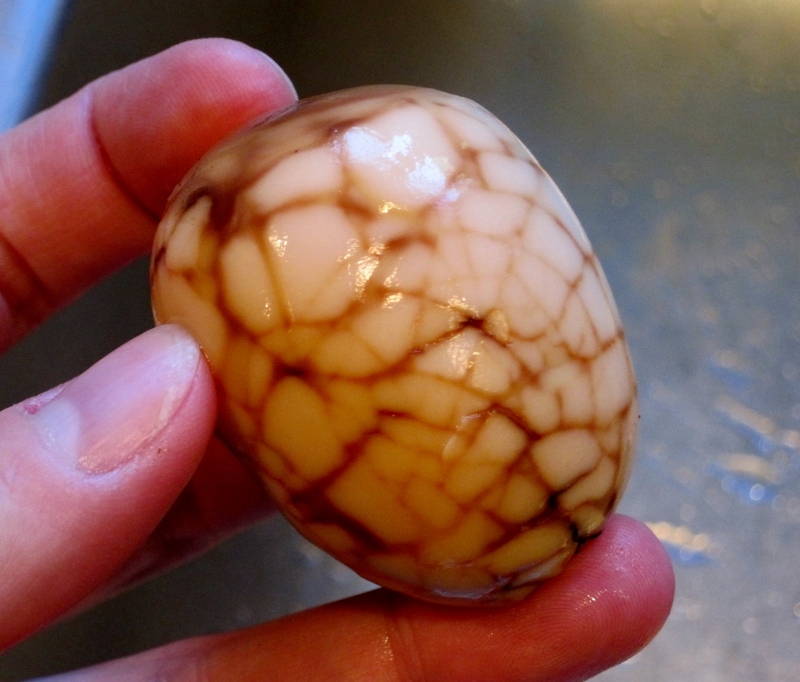 This is because hard-boiled farm-fresh eggs are an absolute nightmare to peel (the membrane between the shell and the white is very tenacious). If you get eggs from the store, they are probably fine to cook right away. Then, boil the eggs however you like to make hard-boiled eggs. 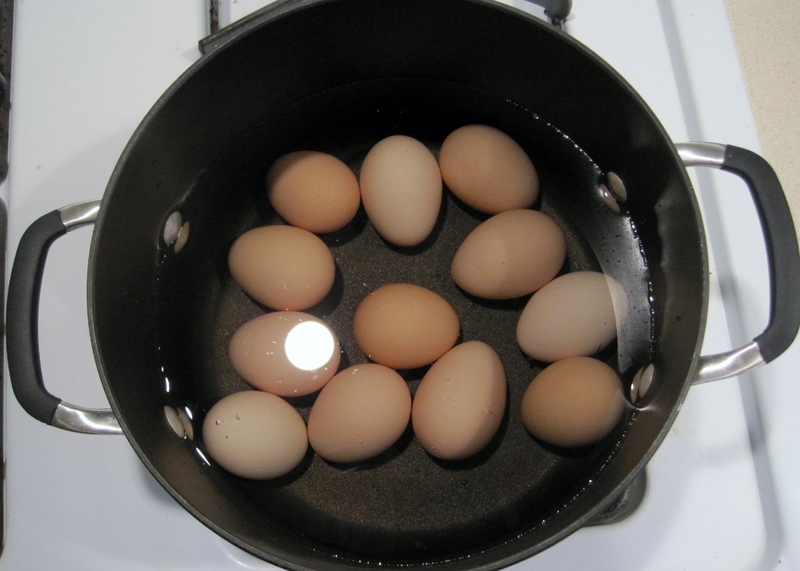 For me, I cover the eggs with cold water, bring them to a boil over medium heat, and boil for 5 minutes or so. Remove eggs with tongs and let them cool in a colander until they are comfortable to touch. Carefully crack them all over as if you were going to peel them, but leave the shell on. 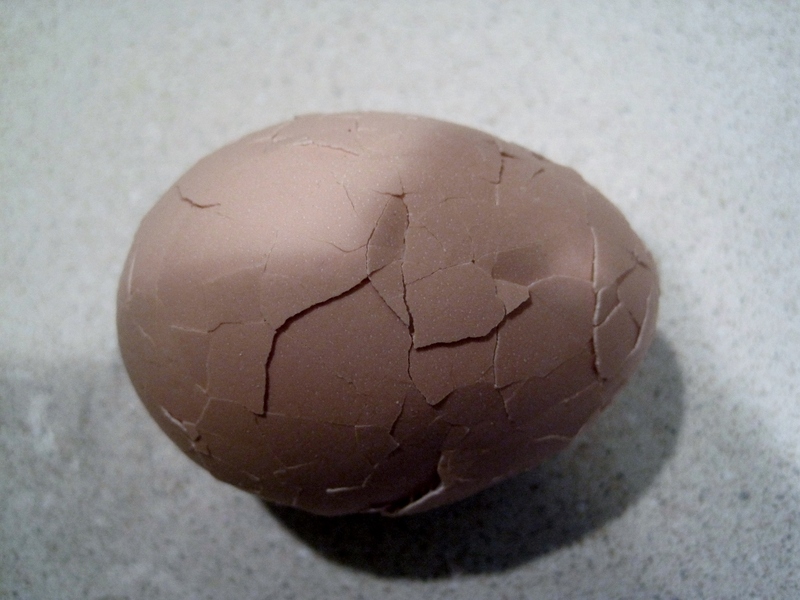 Try not to damage the egg underneath with over-exhuberant cracking. 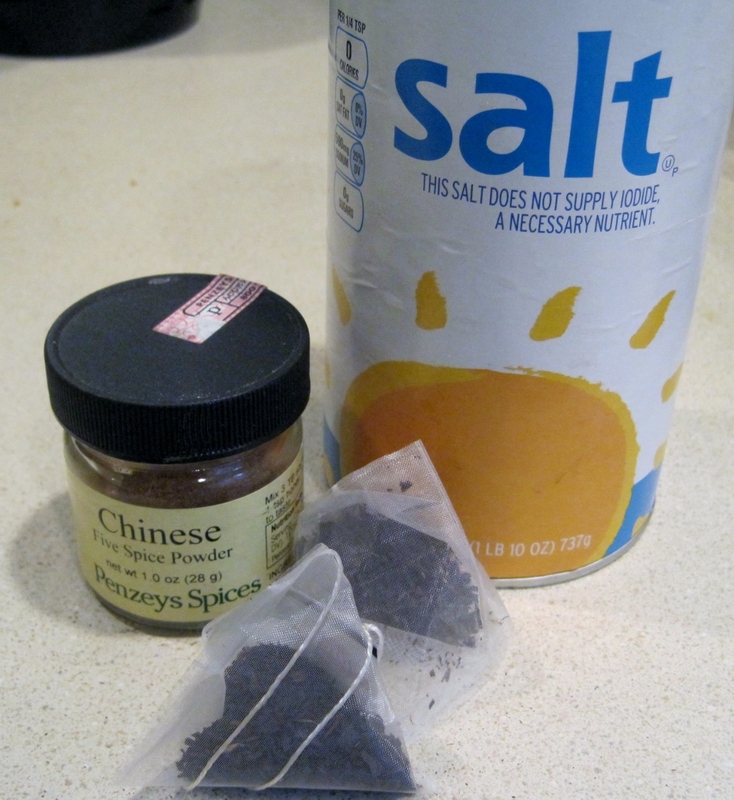 Put a couple of inches of fresh water in the pot along with the black tea bags, chinese 5 spice powder, and salt. The powder will float on the surface of the water, so I whisk it in. Gently put the eggs back into the water and bring it to a simmer. The water level should be slightly higher than the eggs; add more if necessary. Cover and simmer for 3+ hours, checking every now and then to make sure the water is still high enough. Remove the eggs with tongs and let them cool. You can either peel all of them or store them as-is and peel before eating. If you find they are too salty for your liking, a quick rinse under the tap can temper it somewhat. They should be stored in the fridge and probably eaten within a week. Previous My First Romano Adventure Next Fruit wines/ciders/mead! <3! And now I am subscribed too your blog in Feedly.